I love meat. Hence I consider myself a meatatarian. I like it prepared in almost any fashion and gawd I love meat-on-a-stick. 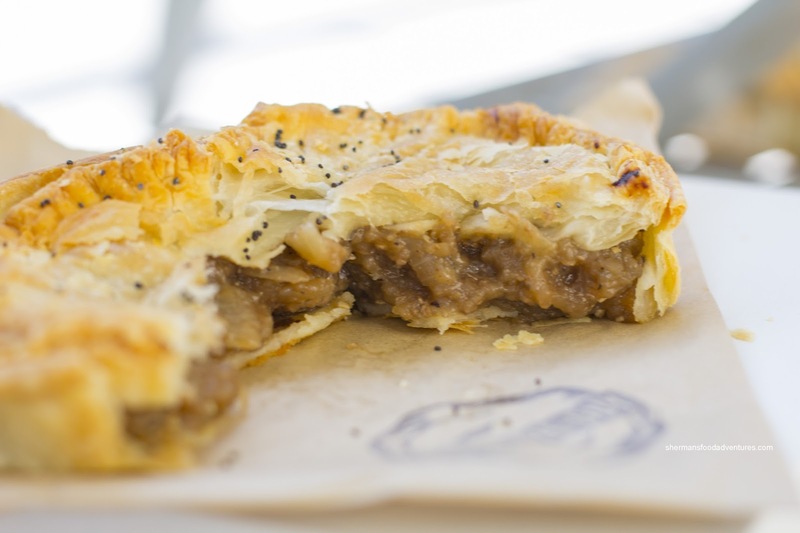 But what about meat in flaky pastry? Sounds good doesn't it? 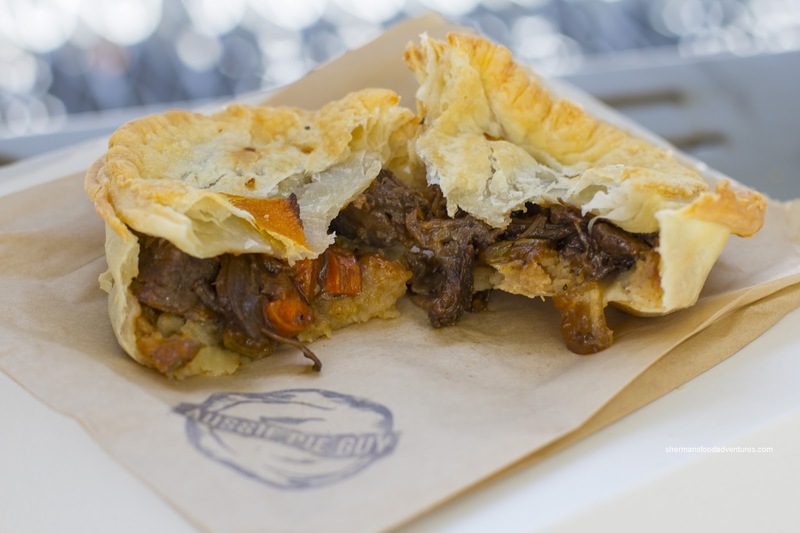 It's compact, transportable and can be eaten without utensils. 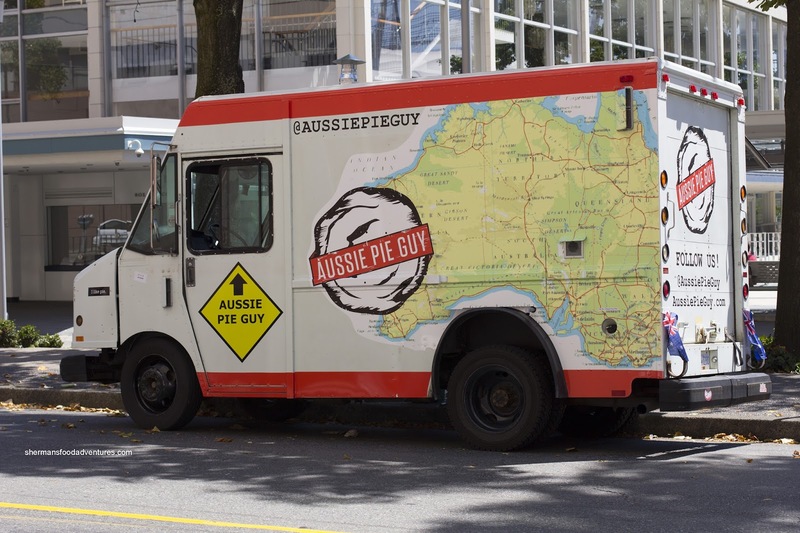 Well, one of the newest food carts, Aussie Pie Guy, serves up meat pies (veggie ones too) for those who want their meat on-the-go. I was actually invited to try a few of these where Sean tagged along to help me eat (hey, I'm no Mijune!). We ended up sharing 4 starting with Shane's Pie consisting of free range BC beef short rib and vegetables with a red wine au-jus and apricot hoisin sauce over mashed potatoes. Let's start with the pie crust first. I found it flaky and dry, but a good dry as it was crispy while still being buttery. Yet, it wasn't greasy and actually quite light. It was browned throughout including the bottom and sides. As for the short rib, it was really tender and meaty where there was considerable depth-of-flavour being sweet with some savoury elements. Next up was the Chook made from local, free run chicken and mushrooms in a creamy white wine sauce. This was packed with chunks of chicken which were understandably firm (due to being free range chicken). I really liked the plethora of tender mushrooms as they added both flavour and texture. The light cream sauce was mild, however it softened the bottom of the pie. Surprisingly, the Aussie Pie itself was not my favourite. Made from chunks of free range BC beef and organic onion, it was bathed in a pepper gravy made with Howe Sound Rail Ale. I found the amount of meat in the pie to be almost non-existent. The thickened gravy was peppery and full of sweet onion flavour, but lacking in substance. Lastly, we had the Porky consisting of slow roasted free-run pulled pork in BBQ sauce, topped with coleslaw made with organic apples and mint. 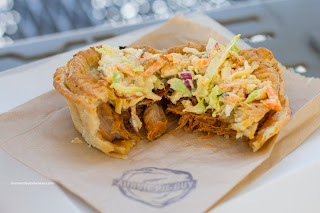 This was packed with large chunks of pulled pork which could've benefited from a touch more sauce, but then again, that would've been bad for the delicate crust. The flavours were quite mild with a touch of sweetness. The creamy coleslaw on top was also sweet and added some crunch. 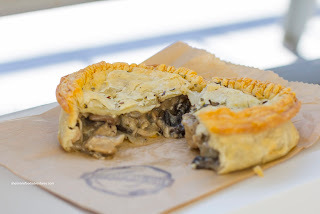 Overall, these are decent pies with a flaky crust when not compromised by the sauce. @Tony ...... um, maybe you should stay away from these food trucks, then ! Maybe @ Richmond Night Market, Tony. One of my favourite cheeky Aussie punk bands, The Cosmic Psychos, cut an album titled "Oh What A Lovely Pie" The title was not referring to the kind of pie you eat. OK, I guess you could say that you do in a sense, but it's not the kind you hold in your hand. OK, I guess you could say that you do in a sense, but, but... You know what I mean. P.S. Roll cursor over the album cover image in the link for accentuated naughtiness. And whatever you do, don't listen to the song "Chainsaw." It's too, too Pickton. Sample lyrics:"When the police found out, I was in a bit of strife. I had to take some hostages -- my two kids and my wife."